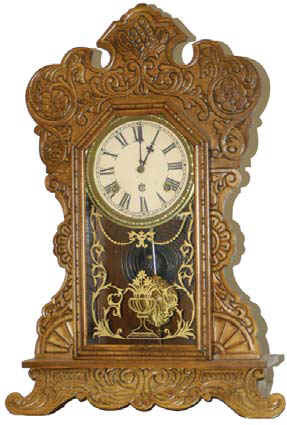 Waterbury Clock Co. kitchen clock, "Forum", ca 1906. Clean oak case is 22 inches high, most of a label on the back, correct glass and pendulum. Paper dial is a replacement. 8 day, half hour gong strike, running. The old case has pressed designs all over; the base is a little different than most oak kitchen clocks. Ly-Waterbury #1657.